I've given a lot of advice to people going to job interviews, on how to write resumes, how to behave during interviews and how to ace job interviews. Now I'm going to reverse the trend, and give interviewers, that is those who interview people for a job interview, a glimpse at what they really should be doing during job interviews. -In my opinion, ALWAYS start with shaking hands (or nodding) and greetings. Here's what will happen otherwise. The brilliant ones will get a job elsewhere. The horses will get jobs elsewhere. The donkeys will work for you, because they couldn't get a job elsewhere. Too many interviewers forget to greet interviewees. -Once you have the interviewee sit, you could use a little bit of small talk, like asking them where they came from and how they struggled with transportation and the weather. -Then, ALWAYS say a couple of words that SHOW that you have read the resume and why you are interviewing them in the first place. MOST people NEVER do this. A lot of times the interviewer won't even have read the resume. Other times they will have read the resume but pretend and act like they haven't read it. That's a terrible mistake. You could start off with something like: I see that you have a college degree in accounting and that you are certified by several organizations, and that you also worked as an accountant, which is basically why we invited you here. -Before you ask questions, say a few words about your company, work environment, what tasks they will be expected to do if they get the job, what the program they will be working for is, the more you say the better. -Now you can start asking questions. You have three interview question types: the militarized type, the tribal type and the free type. -The militarized interview is a very structured interview where you ask a set of questions and expect some kind of correct answer for the question. For example: do you have experience with SPSS, Python and R. If the answer is no, that means you won't hire the person, regardless of other attributes. -The militarized interview is also one that looks for submissive behavior. You don't let the interviewee finish their sentences, you cut them off frequently, and you often hint that they are doing poorly at the interview. You also expect deference and humility from the interviewee, and expect the kind of attitude that matches their low rank within the corporation. 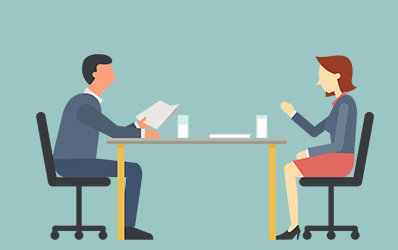 -The tribal interview is one that looks at the group interactions of the interviewee and does not view the interviewee as an individual. You skip questions about individual skills and talents, and move straight to talking about the companies they worked for, the universities they studied at and what majors they studied. -The tribal interview overlooks individual talents and judges the interviewee based on the performance of the schools they attended and the companies they worked for, rather than their own personal achievements. -The free interview is more semi-structured, more of a conversation based on interviewee skills and talents. Interviewees are valued as individuals, and are encouraged to put their abilities forward. Mistakes I've seen interviewers do. -Throwing the resume (or other papers) on the side. -Piling up paper together and slamming it on the table. -Constantly using indirect language and euphemisms. -Constantly looking at their watch. -Leaving without an explanation, coming back after a long absence and not giving explanations as to the absence. -Giving an interview at a ghost company (huge company where basically only the two of you are present) and not making it sound like this is awkward and explaining that there are echoes and there will soon be a lot of people. -Talking about company problems that have nothing to do with the applicant's job description. -Badmouthing colleagues, the city, or the country where the company is located. -Not mentioning that the company is owned by a church or by a cult, if it is so. -Not letting interviewees talk about their perks, and focusing only on their quirks and disadvantages. -Criticizing aspects of the resume. If you didn't like the resume you didn't have to invite them for an interview. -Asking interviewees for all kinds of paperwork and then losing it. Have fun interviewing job applicants!